Industrial policy is back on the agenda in UK politics. Central to the policy debates is the idea of a state bank that can underpin the broad objectives of industrial strategy. Indeed, the global financial crisis set in motion a growing trend in Europe (and worldwide) to boost state development banks (SDBs) and seek to emulate the success of the German experience. Policy debates have focused on learning best practice, but little, if any attention has been dedicated to how newly created SDBs would be funded. Rather, it is assumed that governments put up equity and the rest will be covered by the ‘magic of leverage’ through issuing bonds. There is nothing wrong in principle with this formulation, and it has the benefit of precedence. Labour’s 2017 election manifesto incorporated such a plan for a new National Investment Bank. Their proposal was to create a new bank with £250 billion of lending capacity via £25 billion of government equity base, consistent with the sort of leverage we see in the European Investment Bank for example. Whilst we fully support Labour’s proposal, we outline here how to take the plans further by proposing a different funding strategy for SDBs, one that exploits the reality of how the financial system operates today. Our two-stage proposal would harness the money creation power of the central bank by adapting – and simplifying – lending practices used in shadow banking. Central bank money would thus be injected in the financial system via lending collateralised with assets that have an immediate and direct impact on growth. In this monetary game, shadow banking meets central banking for the public good. State development banks in the western world should more accurately be described as national investment funds, since they are designed to deliberately circumvent the money creation power of a traditional commercial or central bank. In doing so, a framework is set up between Treasury departments (formally acting on behalf of taxpayers), and institutional investors (formally acting on behalf of savers). This is a fiscal game – with a government bond or government-backed bond – the instrument of choice. This marketable debt security creates a significant corporate treasury bureaucracy; more importantly it diverts attention from the priority of purely assessing loans, to assessing loans in the context of the liabilities supporting it, creating a running commentary on rating agencies and credit quality. What if a new state development bank in the UK was instead set up as a monetary game? This would require an initial funding structure that does not rely on borrowing from capital markets, and an implementation structure that does not rely on existing banks for money creation to provide loans. Our proposal outlines how this could be achieved. The details set out below are technical but we provide them in full in order to encourage debate about our proposal and so we welcome feedback and further discussion. In Stage 1, lending without direct money creation, the new bank has full autonomy in extending loans but would not be created as a deposit-taking institution. It rather expands the retail funding base of the private banking sector, by closely coordinating with the Bank of England in an extension of the existing unconventional monetary policy framework. In Stage 2, the bank becomes a full deposit-issuing institution. Governments would have the option of remaining with Stage 1, or eventually switching to Stage 2. The bank would make loans directly to borrowers in line with industrial strategy objectives, often unsecured and long-term, under a ‘socialised loss’ framework. The chart below shows how this work through the example of a new SBD providing a loan to a green energy company. The SDB would simultaneously create a liability – a ‘deposit’ – in favour of borrowers (see chart below). This is different from the traditional process of private bank loans creating deposits because borrowers would not be able to use SDB ‘deposits’ to make payments. Rather, the SDB will enable borrowers to transfer their SDB ‘deposit’ to any private commercial bank. This expands the retail-funding base of the private banking sector. While customers transfer the SDB ‘deposit’ to a private bank (arrow 1 in the chart), the SDB keeps the loan. SDB owes that private bank an asset, and will give it in the form of central bank money, i.e. Bank of England issued reserves. To effect this, the SDB would have to borrow reserves from the Bank of England. The SDB would take the customer loans and use them as eligible collateral to borrow from BoE (arrow 2 in the chart). 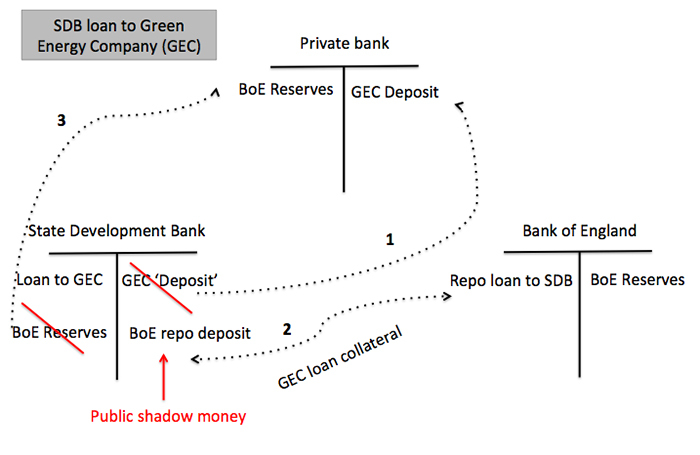 BoE registers a repo loan to SDB, and issues reserves that SDB uses to settle its debt to the private bank (arrow 3 in the chart). The repurchase agreement or ‘repo’ loan with the Bank of England would have a tenor that matched that of the underlying loan. A loan repayment will allow the SDB to immediately reduce its outstanding loans with the Bank of England. In designing the terms of the repo loans to the SDB, the Bank of England will carefully draw from the lessons of the global financial crisis. The extensive use of short-term repo loans enabled shadow banking to expand rapidly before the crisis. Repos became the money of the shadow banking system – shadow banks would purchase securities and use them as collateral to borrow and aggressively grow balance sheets, greatly amplifying cycles of leverage and financial fragility. That many observers – Bank of England included – describe the collapse of Lehman Brothers as a run on repos illustrates starkly the systemic nature of this shadow market. Under our proposal, the SDB would fund itself with truly public shadow money – that is through promises to pay made to the Bank of England secured by loans. In turn, the Bank of England would harness the liquidity enhancing properties of the repo instrument while mitigating its volatilities. It would lend against long-term SDB loan collateral. In a conceptual extension of the already existing Term Funding Scheme (TFS), the Bank of England would match the duration of the repo loan to the duration of the underlying SDB loan (thus replacing the arbitrary 4 year maturity in the TFS). It would do so without using pro-cyclical collateral valuation techniques that proved detrimental in the global financial crisis. While private finance re-values collateral constantly to reduce risks inherent in any repo loans, without concerns for financial stability, the central bank need not do so. The potential losses – from the underlying asset becoming a bad loan – are in no way different from those underpinning other unconventional monetary measures, and do not matter for the central bank. In any event some potentially uncomfortable truths about purchasing power creation are now firmly out of the closet. In Stage 2, the business model outlined above– direct lending without deposit issuance – could easily be transformed in time into a standard deposit-taking institution. Customers who had taken loans from the bank, could over time open deposits with it. This would reduce the need to draw on Bank of England for settlement balances via the repo process. Our proposal requires that the SDB works closely with the Bank of England. This, to many, would appear to be a threat to its independence. Yet it is important to bear in mind that central banks have themselves changed significantly since the global financial crisis. This creates an opportunity for a state development bank of significant size to join up thinking. Central banks are the most flexible conduit for scaling such an initiative. The Bank of England has already experimented with unconventional monetary policies that involve either targeted monetary stimulus or close coordination with the Treasury. It has, since 2015, changed its operation framework to formally commit to support capital markets in crisis (as market maker of last resort). A closer relationship between monetary stimulus and industrial strategy goals is both desirable, and under our scheme, possible. Our monetary game would not spell the end of the Bank of England’s independence. The Bank of England would monetize loans made according to the industrial strategy, rather than government or corporate bonds under QE generally, or commercial bank loans – including those feeding housing bubbles – in the TFS scheme specifically. Losses on any of these schemes are possible, and of no (macroeconomic) consequence. Monetization would not be ‘endless’, in that the size of the state development bank would be decided according to industrial strategy. The balance sheet of the Bank of England may be permanently higher, but that is not an impediment to interest rate policy, and will help meet the increased structural demand for reserves that has been created by Basel III liquidity regulations. Finally, in a post-crisis world where it is now commonly accepted that any central bank intervention has distributional consequences, harnessing the money creation power of the central bank for the public good is a valid and desirable policy objective. These are the authors’ personal views only. The conclusions of the group that helped draft Labour’s policy on a new National Investment Bank were reached by consensus. Daniela Gabor is Professor of Economics and Macrofinance at the University of the West of England. She is researching shadow banking, and writing a book on Shadow Money: a comparative view of US, EU and China. She tweets @DanielaGabor. Leandros Kalisperas has worked across banking, asset management and pension funds over the last 15 years, and is now on a sabbatical reconnecting with research and policy interests. He is in the process of completing a book, The Final Push: Rewriting the Left’s Political Economy.